Access the Smart Trim feature. Go to the Actions Bar and click Tools. After the panel pops up, navigate to Smart Trim. By default, Manual Smart Trim Mode is enabled. It will analyze the clip. Click the Smart Trim Options button on the top right of the interface. 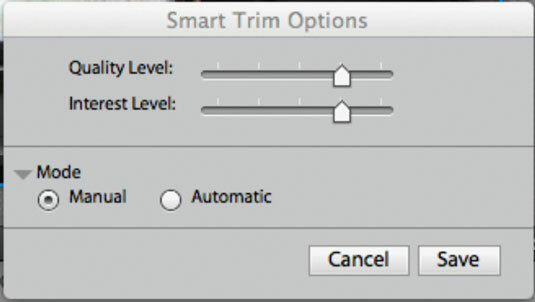 After the dialog opens, adjust the slider to specify the options as well as setting it for automatic or manual smart trimming. Depending on the Quality and Interest values you choose, it highlights sections of the clip. Striped patterns emphasize the areas to trim. Quality factors include blur, shaky, brightness, focus, and contrast. Interest factors include faces, camera moves, and close-ups. Double-click the clip to select all the area you can trim in a single clip. You can also select sections in multiple clips by dragging the marquee over the desired clips and right-clicking or Ctrl+clicking (Option+clicking on the Mac) the trim sections. You’ll see the selected trim sections are highlighted. When you select a section, all trimable sections turn into blue-striped sections. After right- or Ctrl/Option+clicking the selection, the Smart Trim options, pop up on the screen. Select the one you need for the clip or just click the striped part and delete. Smart Trim is not perfect. It often designates parts of the clip that are technically acceptable for removal. For example, panning the camera and movie subjects can confuse it. You cannot use Interest as the only factor. Interest and Quality factors work together. Trim sections get shorter when you move the slider from right to left. A clip that is low in Quality or Interest gets trimmed. A clip that is high in Quality or Interest doesn’t get trimmed. You can also trim clips using the Delete key. Just select the clip and press Delete. Undo the previous trim action. 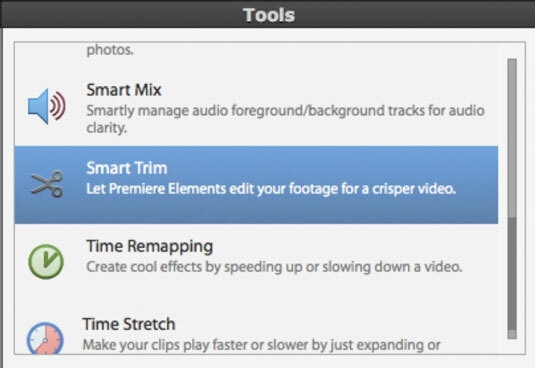 Right-click or Ctrl+click the clip and select Undo Smart Trim. Exit the Smart Trim mode. Click the Done button.